7:00-8:00pm Panel Discussion -- "In Print: Exploring books as medium, art object and archive in Detroit and beyond"
An interactive exhibition of books suspended in mid air. The exhibition will be open from Thursday, July 11 through Saturday, July 13. Hosted by the Detroit Community Library @ the Jam Handy Building. 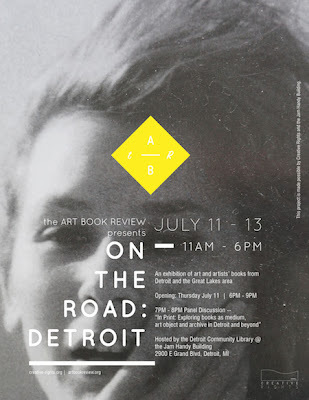 The Art Book Review's "On the Road: Detroit" is an exhibition of art and artists' books from and about Detroit and the larger Great Lakes-area. Organized by L.A.-based publication the Art Book Review, the project will feature a curated display of exhibition catalogues, artist monographs, small run and handmade artists' books and zines amongst other types of ephemera and publications gathered through an open call to artists and publishers. The exhibition will be on view at the Jam Handy Building at 2900 E Grand Blvd, Detroit, MI from 11am-6pm, July 11th-13th, with an opening event July 11 from 6-9pm featuring a panel, "In Print: Exploring books as medium, art object and archive in Detroit and beyond" from 7-9pm.